ATLANTA (May 13, 2013) – The Georgia Post Building, located in Knoxville, Crawford County, Georgia, was listed in the National Register of Historic Places on May 1, 2013. The nomination was supported by the Crawford County Board of Commissioners, which owns the building and the Crawford County Historical Society, which leases the building. Nomination materials were prepared by the preservation planner for the Middle Georgia Regional Commission. The Georgia Post Building was built in 1928 to house the printing press and editorial operations for The Georgia Post newspaper. Founded on January 1, 1922, by Crawford B. H. Moncrief (1889-1950), the weekly paper was published from his house in its early years. In 1928 production was relocated to this building, located on the same property as Moncrief’s house (no longer extant). Historically, the front two-thirds of the building was used for the newspaper and the rear one-third was separated by a curtain and was the pressroom, kept warm so the inks would flow easier when printing in cold weather. Circulation for The Georgia Post was primarily the county seat of Knoxville, the larger nearby town of Roberta, and the surrounding rural area of Crawford County. Publication numbers probably remained close to its current publication of 3,000 copies. Crawford B.H. Moncrief published the newspaper until his death on November 14, 1950. His widow, Annie L. Culverhouse Moncrief, and daughter-in-law Anne Moncrief continued publishing the newspaper. In 1954, the newspaper was edited in the home of Anne Moncrief and printed in Butler in Taylor County. In 1959, the newspaper building was sold to H.C. Walker and The Georgia Post sold to Homer C. Seagler in October 1959. The Georgia Post is still published today in Roberta. 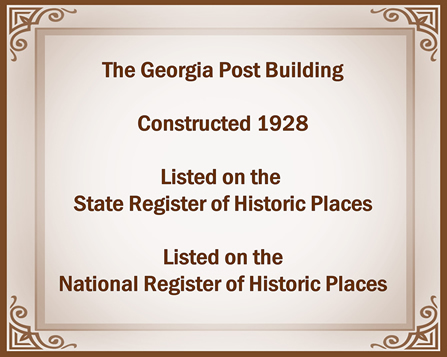 The Georgia Post Building was listed in the National Register at the local level for its association with the publication of The Georgia Post newspaper. 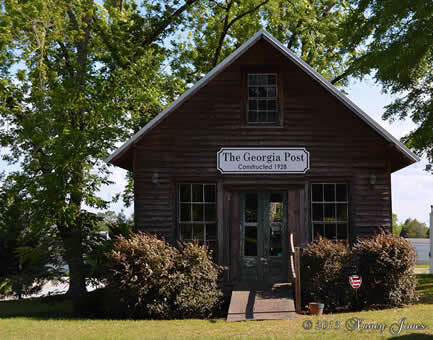 As a small-town and county-seat newspaper, The Georgia Post served Crawford County as a source of local news, society happenings, and legal ads. The building is an excellent and intact example of a small-town newspaper office. The building retains a high degree of integrity and retains its exterior and interior character-defining features including exterior and interior materials and floorplan. Located in downtown Knoxville, less than one block from the historic Crawford County Courthouse, The Georgia Post Building is a one-story, one-room, frame, front-gable building. The exterior is unpainted weatherboard siding and the foundation is fieldstone piers. A painted sign with “Knoxville Journal cir. 1898” is above the front entrance, although the building has only housed The Georgia Post newspaper. The interior is one large room with a cast-iron stove in the center. The building retains its original wood floor and beadboard ceiling. The walls are original beadboard and some nonhistoric horizontal wood paneling. Changes to the building were made in 2004 and 2005 and include installing a ramp at the front entrance for ADA accessibility; replacing paneled-wood doors with antique wood-and-glass doors; and replacing the original metal roof with a new metal roof. The building sits close to the road with no sidewalk. Ornamental foundation plantings and mature trees surround the building. The National Register of Historic Places is our country's official list of historic buildings, structures, sites, objects, and districts worthy of preservation. The National Register provides formal recognition of a property's architectural, historical or archaeological significance. It also identifies historic properties for planning purposes and insures that these properties will be considered in the planning of state or federally assisted projects. National Register listing encourages preservation of historic properties through public awareness, federal and state tax incentives, and grants. Listing in the National Register does not place obligations or restrictions on the use, treatment, transfer, or disposition of private property. The Historic Preservation Division (HPD) of the Georgia Department of Natural Resources serves as Georgia’s state historic preservation office. 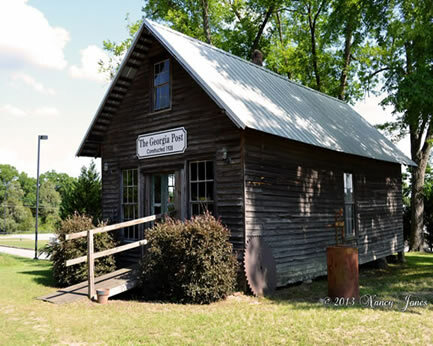 Its mission is to promote the preservation and use of historic places for a better Georgia. HPD’s programs include archaeology protection and education, environmental review, grants, historic resource surveys, tax incentives, the National Register of Historic Places, community planning and technical assistance.